Lock in a great price for Guesthouse Villa Globus – rated 9.4 by recent guests! Perfect location. Close to the city center. Host was very helpful. Shops and Restaurants are nearby. The owner Sannel was so nice and helpful. He told us a lot about Mostar and the horrible war. The host was wonderful with recommendations and he has a bar down the street. The host was very nice, the accomodation is next to the center. The room was nice and comfortable. It is centrally located near to all attraction within walking distance. The facilities are just perfect for two of us. Having a small kitchen add value to the guest house. The owner is extra joyful and friendly especially to foreigners. He explain everything we need to know about the town and direction to those places of interest. A private parking is a plus factor especially for our big size overland Land Cruiser. Sanel was a wonderful host--super friendly and informative about Mostar and BiH. I used the kitchen a lot during my five days at Villa Globus and found it well stocked for my needs. Great location--on a quiet street where you can hear birds in the morning, but minutes by foot from everything you need. Very nice staff - the host gave us a lots of valuable recommendations for Mostar, and gave us interesting insights into the city's history. There is a small parking right in front of the place, which however needs to be reserved. 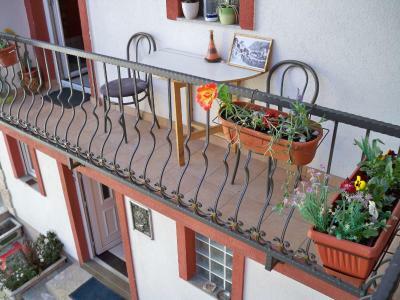 A shared kitchen with a small balcony is available. Right in the old town, short walking to the Old Bridge. Room has all need and is comfortable. Unbeatable location; right in the old town. Excellent staff; the owner gave info about the area, food recommendations, helped us with directions in/out of Mostar and was very attentive to everything. On-site private parking; incredibly important since parking in the old town is very hard to find. Fast free wifi. Great value for money; good/clean facilities. The villa is perfectly located - just 300 m. from the center. At close proximity there are shops, ATM etc. So - super location. We were welcomed extremely warm by the lady owner. She showed us a couple of rooms to choose from. Note that each room has a private bathroom and in addition, guest can use the shared kitchenette also available when staying at Vila Globus. In addition to the great welcoming - Vila Globus provided us with a welcome drink in one of the top restaurants in Mostar. So, really a great place and service. Guesthouse Villa Globus This rating is a reflection of how the property compares to the industry standard when it comes to price, facilities and services available. It's based on a self-evaluation by the property. Use this rating to help choose your stay! 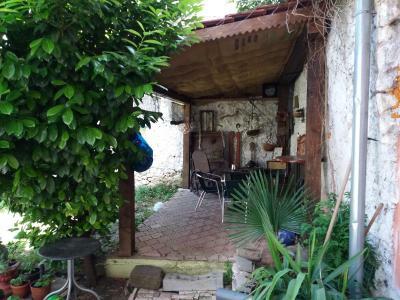 Villa Globus is a self-catering property set in Mostar’s center, only a 2-minute walk from the UNESCO-protected Old Bridge. The property offers free WiFi. All rooms consist of air conditioning and cable/satellite LED TV and a private bathroom with a hairdryer. Guests are free to use the common kitchenette and balcony. There’s a bar on site and guests get a free welcome drink upon arrival. The property can organize rafting on the Neretva River and trips to Međugorje, Kravica Waterfalls and other popular destinations. Within 30 feet of the Villa Globus, you may find two restaurants, serving breakfast. The nearest super market is just 150 feet away. Karađoz-bey Mosque and national monuments of Muslibegović and Biščević House are all within a 600 feet radius. Međugorje is 7.5 mi away, while the Croatian border is 37 mi away. 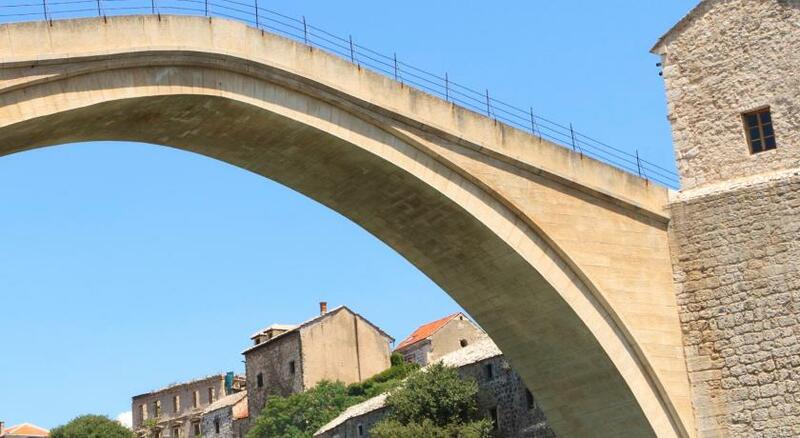 Shuttle service can be arranged at a surcharge from and to the main bus and train station, 0.6 mi away, and from and to Mostar Airport that is 1.9 mi from the Globus. On site parking and a garage parking for motorcycles are available upon a reservation. 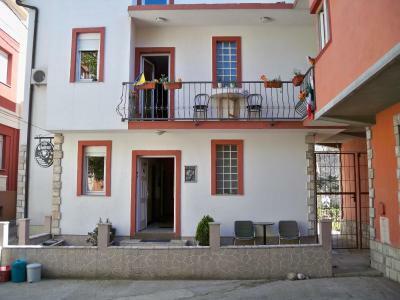 뀐 Located in the top-rated area in Mostar, this property has an excellent location score of 9.7! 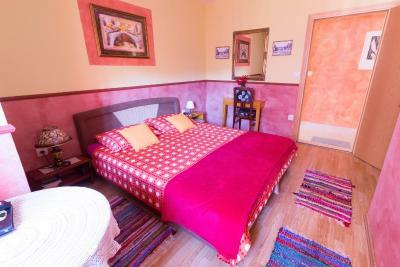 When would you like to stay at Guesthouse Villa Globus? Modernly equipped with LED satellite TV and air conditioning, this room has a private bathroom with hairdryer and toiletries. There is possibility of using the kitchen and parking within the property. Modernly equipped with LCD cable TV and air conditioning, table and chair, this room has a private bathroom with hairdryer and toiletries. There is possibility of using the kitchen and parking within the property. 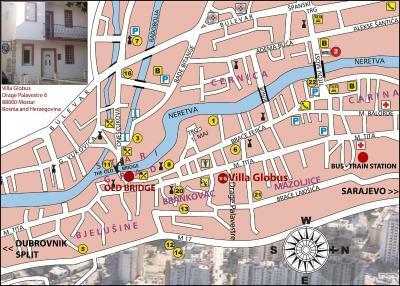 Villa Globus stands out with its very strict cetru positions in the old city. 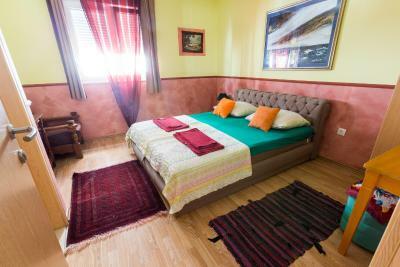 Villa Globus is located 400 meters from the Old City, the Old Bridge and the Old Bazaar. The old Ottoman houses, museums and all other cultural monuments are located just a 2 minute walk from us. Villa has its own parking lot and garage, which is rare in this part of the city. Bus and train station are 800 meters away from us in the south when you go down the street Marsala Tita. National cuisine only 50 meters, supermarket 50 metara.Villa the type of couples and we try to make our guests feel like at their own home .Villa has its own garden house, a small kitchen and a balcony. House Rules Guesthouse Villa Globus takes special requests – add in the next step! Please inform Guesthouse Villa Globus of your expected arrival time in advance. You can use the Special Requests box when booking, or contact the property directly using the contact details in your confirmation. The host was excellent. He gave us a lot of information about where to go and background information about the cultural sights. Also the room was on a good location (close to the old part) and looked very nice and clean. This is one of the best value and friendliest places I've stayed on my travels. 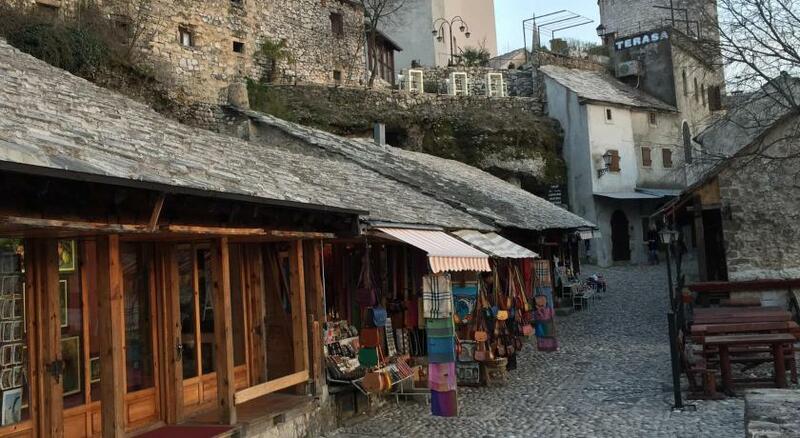 Sanel, the owner, made a big effort to explain about the recent history of Mostar to me, recommended some top places and runs a great guest house which is just a few minutes' walk from the old town and famous bridge. The room and all facilities were perfect for me. The coffee was so good! The rooms were nice and the host and staff were so friendly and helpful. They provided slippers etc. Great location, easy walk to the old bridge. Felt like you were in a home! Also, very secure. Lovely host and clean room. All the damaged buildings is heartbreaking. Perfect location, easy walk to bus station, close to many restaurants and grocery stores. Nice owner that provided me with all the information I needed. Region produce some of the best mandarins in the world. - Lovely owner who immediately makes you feel at home and gave great tips about the sights to see and restaurant recommendations. Always on hand if you need anything. 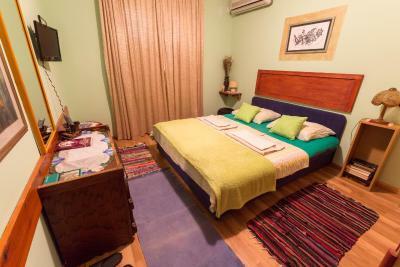 - Amazing location just a few minutes from the main street into the Old Town of Mostar, but also a nice little break away from the hustle and bustle of the touristy centre. 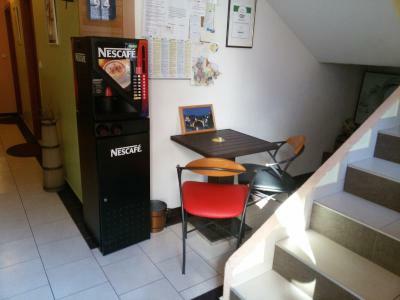 - Supermarket is a 2 minute walk and the guesthouse has a kitchen that you can use... I did not cook as the food in Bosnia is amazing and inexpensive to eat out but it is available and I appreciated being able to make a cup of tea! - The room was clean and cosy... loved the decoration of the house in general, it felt very homey! Nothing. It's a great place, owner very hospitable. Note narrow road in front. Parking on site. Location into town, place lovely, owner knowledgeable and willing to talk about towns history and past. Making experience more real. Mostar brilliant location to visit. I like the thoughtful and easy going personality of the owner. A good man that share the love of his town to others. The place is safe, 1 street parallel from the bustling main street. The owner made us feel very welcome. It was nice to talk to him about Mostar and Bosnia in general. 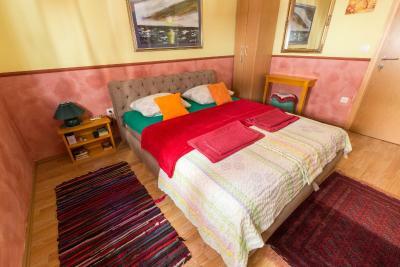 The guest house is very clean, in a great location, has very comfortable beds and air conditioning in the rooms. Free car parking in front of guesthouse was handy. Definitely recommend this place when visiting Mostar. The owner was very friendly and helpful the location was excellent so central and there is private parking. Wasn’t so sure on first impressions but it definitely grew on us. 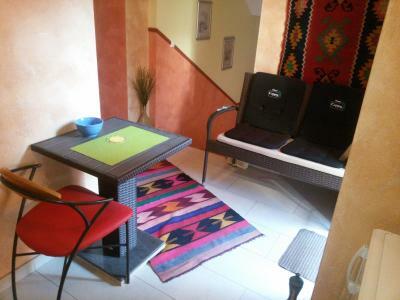 Basic, clean, quiet accomodation, perfect location for the old town. The host is welcoming and helpful. Basic shared kitchenette with fridge was adequate for preparing snacks/light meals.